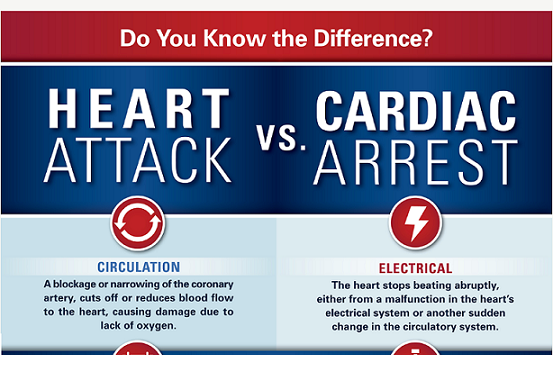 How Heart Attack & Cardiac Arrest are different? The terms heart attack and sudden cardiac arrest are often used interchangeably, even in the media. But these two conditions are NOT the same. Knowing the symptoms of each, and what to do if you witness either of these conditions, can mean the difference between life and death. Familiarize yourself with the info-graphic below so that you can pass on the correct information and by doing so, possibly save a life. A heart attack occurs when a blocked artery prevents oxygen-rich blood from reaching a section of the heart. If the blocked artery is not reopened quickly, the part of the heart normally nourished by that artery begins to die. The longer a person goes without treatment, the greater the damage. Symptoms of a heart attack may be immediate and intense. More often, though, symptoms start slowly and persist for hours, days or weeks before a heart attack. Unlike with sudden cardiac arrest, the heart usually does not stop beating during a heart attack. The heart attack symptoms in women can be different than men.